People rave about our island menu, we feature Belize dishes and everything is made from scratch. We can accommodate some diets, but not all. If you have a special diet, please read this section. There is no restaurant on the island, all of our meals are served buffet-style. Our Belizean food menu is designed to take advantage of the fresh seafood of Belize and fresh fruits and vegetables available in the local markets. A typical dinner includes one appetizer, one entrée (fish, chicken or pork), two side dishes including fresh vegetables and carbohydrates, and dessert. Fresh homemade breads and salads are often served as part of the meal. 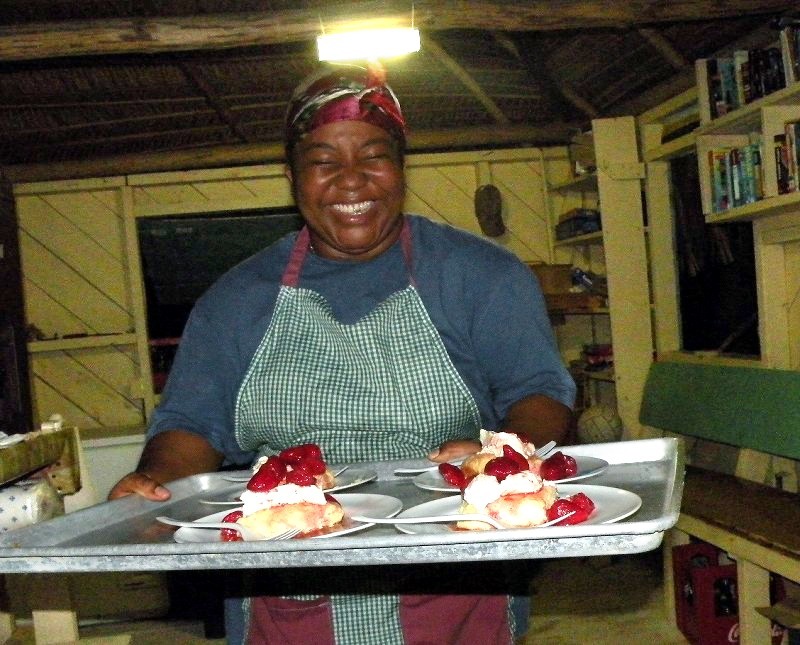 Inland we eat home-style Belizean meals at the lodges we use (sorry, we can’t provide a copy of their menus). Vegetarian and gluten-free guests will find our menu adapts easily. We also accommodate life-threatening allergies and cheese-free (but not dairy free) diets (continue reading for further information on these options). Persons with a vegan diet can NOT be accommodated. Guests may not utilize our kitchen to cook their own food, it is used by our staff only. If you do not eat something on the menu for any given meal, no alternates are available, you simply eliminate what you don’t wish to eat. For all dietary restrictions we are able to accommodate, advance notice is required. Our island menu provides options for every kind of diet, but not every thing every single person would want. We designed this menu to be as varied as possible so that everyone finds something they like. However, we cannot accommodate any special requests simply because there are too many different diets out there. Obviously if we accommodate one we must accommodate all. Today many different dietary restrictions are common: gluten free, gluten and grain free, vegan, meat free, sugar free, carb free, Paleo, allergic to dairy, allergic to butter only, raw food only, cooked food only, no nuts, no nightshades, etc. There are usually several people with different restricted diets present on one trip, sometimes eight different diets or more. Therefore, we are not able to cook entirely different dishes for anyone. We ask prospective guests to simply review our island menu and see if they can get enough to eat by not eating the dishes they don’t like. Our system, so far out to sea, with the cooks never visiting a store, no grocery story on the island, no walk-in refrigerator (we do not run generators), and two women doing all of the cooking day after day means that we must serve everyone the same dishes at each meal. What we can accommodate in addition to vegetarian and gluten-free diets: 1. Life-threatening allergies. Guests who carry an epinephrine pen for a food allergy can be assured we will either not serve, or completely quarantine, those items for that week. For example, if someone carries an epinephrine pen for a nut allergy, we remove nuts in all dishes except the granola (which is made in large batches in advance) for the full week for the full group. 2. Cheese-free. We can leave cheese out of all dishes for that person only if someone requests it in advance. The problem with multiple food allergies: We cannot accommodate multiple allergies, because we remove the offending ingredient for the whole group. We cannot remove nuts, wheat, tomatoes and onions (for example) from the entire menu for a week. It is simply not possible under our system, and presumably the rest of the guests and staff like those items as part of their diet. Persons who cannot or will not eat onions, potatoes, tomatoes, garlic, or peppers should realize those are staples in Belize, and are in many of the dishes we serve. What do we drink on Long Caye? We use a rainwater collection system, and this water is then purified. We have a solar-powered refrigerator to chill our beer and soda, which is included in the trip price. Diet drinks are not available from our distributor (we only use returnable bottles). We also have fresh orange juice and juice concentrates for mixing with water or for cocktails. Regarding alcohol, we supply beer; and guests have to bring their own rum or other alcoholic beverages which can be purchased in Belize. There is no ice.